이전 포스팅에서 다루었던 우유의 불편한 진실 1편 (우유와 암과의 관계)에 이어 우유와 뼈와의 관계에 대한 포스팅을 시작하겠습니다. 우유의 불편한 진실에 나왔던 내용들은 정말 일반적인 상식에서 벗어난 충격적인 내용들이 많이 있었습니다. 우유의 불편한 진실에서는 암 발생관계도 충격적이었지만 누구나 알고 있듯이 우유를 먹으면 키가 크고 뼈가 튼튼해 진다는 상식과 반대되는 내용 또한 다루고 있었습니다. 우유를 많이 소비하는 나라일수록 경부골절 환자수가 많다는 것을 보여주는 도표입니다. 출처를 알 수 없는 중국에서 시행된 연구 결과 였습니다. 저번 암과의 상관관계에서도 말씀드렸듯이 이러한 국가별 연구결과는 신뢰할 가치가 없습니다. 연구라는 것은 생활 습관 패턴이 비슷한 대상들에 대해 우유 소비량의 차이만 존재할 경우 어떤 결과의 차이를 보이느냐를 가지고 연구해야 제대로 된 연구결과라 할 수 있습니다. 이렇듯 국가별 비교는 각국가간의 식이 패턴, 생활 환경, 활동범위, 유전자적 차이, 일광지수, 골절의 위험요인 등등의 차이에 대한 배제가 제대로 이루어 질 수 없는 연구이기 때문에 그래프의 결과만 가지고서 우유를 먹으면 오히려 골절이 증가할 것이라고 단정해서는 안될 것입니다. 그럼 실제로 우유 소비량과 골절 발생에 관한 연구가 있는지 문헌 검색을 해 보겠습니다. JAMA Pediatrics(자마 소아) 학회지에 실린 최신저널은 청소년기의 우유 섭취와 노인이 되었을 때의 골절의 위험에 대한 연구를 시행 하였습니다. During follow-up, 1226 hip fractures were identified in women and 490 in men. After controlling for known risk factors and current milkconsumption, each additional glass of milk per day during teenage years was associated with a significant 9% higher risk of hip fracture in men (RR = 1.09; 95% CI, 1.01-1.17). The association was attenuated when height was added to the model (RR = 1.06; 95% CI, 0.98-1.14). Teenage milkconsumption was not associated with hip fractures in women (RR = 1.00 per glass per day; 95% CI, 0.95-1.05). Greater milk consumption during teenage years was not associated with a lower risk of hip fracture in older adults. The positive association observed in men was partially mediated through attained height. 결과는 흥미롭게도 청소년기에 우유 한컵을 더 마실수록 남성에서는 9%의 골절의 증가를 보였고, 여성에서는 우유 섭취와 골절과의 상관관계가 없는것으로 나왔습니다. 남성에서의 결과를 키로 보정하였을 때는 6%로 골절의 위험이 감소하였습니다. 이 결과를 어떻게 받아들여야 할까요. Milk and yogurt consumption are linked with higher bone mineral density but not with hip fracture: the Framingham Offspring Study. 골다공증 학회지에 실린 우유와 요구르트의 BMD(bone mineral density : 골밀도)에 대한 영향을 보기 위한 연구 입니다. 골밀도는 뼈의 충실도를 보기 위한 검사 수치입니다. 골 밀도가 낮을 수록 뼈가 촘촘하지 않고 비어있다는 의미입니다. 물론 골밀도가 낮을 수록 골절의 위험도는 커지겠지요. Mean baseline age was 55 (±1.6) years, range 26-85. Most dairy intake was positively associated with hip and spine BMD. Intake of fluid dairy and milk was related with hip but not spine BMD. Yogurt intake was associated with TR-BMD alone. Cheese and cream intakes were not associated with BMD. In final models, yogurt intake remained positively associated with TR-BMD, while cream tended to be negatively associated with FN-BMD. Yogurt intake showed a weak protective trend for hip fracture [HR(95%CI), ≤4 serv/week, 0.46 (0.21-1.03) vs. >4 serv/week, 0.43 (0.06-3.27)]. No other dairy groups showed a significant association (HRs range, 0.53-1.47) with limited power (n, fractures = 43). Milk and yogurt intakes were associated with hip but not spine BMD, while cream may adversely influence BMD. Thus, not all dairy products are equally beneficial for the skeleton. Suggestive fracture results for milk and yogurt intakes need further confirmation. 본 연구에서는 26세 이상의 성인(평균연령 55세)에서의 우유와 요구르트의 섭취가 골밀도에 어떤 영향을 미치는지를 보기 위한 연구였습니다. 결과를 보면 우유와 요구르트가 골반뼈의 골밀도를 증가시키시만 척추 뼈에는 영향을 미치지 않는다고 합니다. 두가지 연구에서는 첫번째를 보면 우유의 섭취가 여성에서는 골절과 관련이 없지만 남성에서는 약간 골절을 증가시킨다고 되어 있고, 두번째에서는 우유의 섭취가 골반뼈의 골밀도를 증가 시키지만 척추뼈에는 영향이 없다는 것을 보여주고 있습니다. 두가지 연구를 봐서는 확실히 우유가 골절을 증가시킨다고 이야기 하기 어려우며 그렇다고 해서 확실히 뼈를 튼튼하게 해준다고도 이야기 할 수 없을 것입니다. 위의 연구들은 가장 근거 높은 메타 분석이나 RCT가 아닌 연구로 코호트 연구 입니다. 코호트 연구는 특정 요인에 노출된 집단과 노출되지 않은 집단을 추적하고 연구 대상 질병의 발생률을 비교하여 요인과 질병 발생 관계를 조사하는 연구 방법으로 메타 분석, RCT보다 낮은 근거수준을 지니고 있습니다. 우유 섭취와 골반 골절의 위험과의 관계에 대한 메타 분석이 한편 검색 되었습니다. 본 연구는 위의 두가지 연구들과 같은 코호트 스터디들을 모아 분석한 메타 분석입니다. Journal of Bone Mineral Reserch는 IF(Impact factor) 5.4로서 괜찮은 점수를 보여주고 있습니다. The results show that in women (6 studies, 195,102 women, 3574 hip fractures), there was no overall association between total milk intake and hip fracture risk (pooled RR per glass of milk per day = 0.99; 95% confidence interval [CI] 0.96-1.02; Q-test p = .37). In men (3 studies, 75,149 men, 195 hip fractures), the pooled RR per daily glass of milk was 0.91 (95% CI 0.81-1.01). Our conclusion is that in our meta-analysis of cohort studies, there was no overall association between milk intake and hip fracture risk in women but that more data are needed in men. 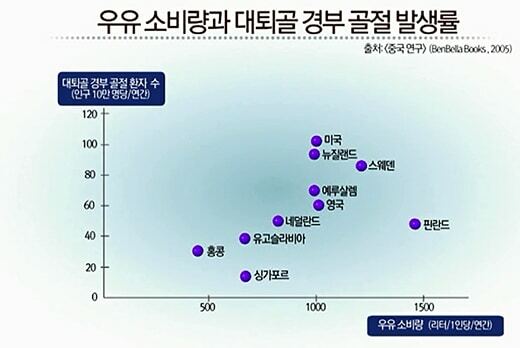 결과는 여성에서는 우유 섭취와 골반골절과의 관계는 없고, 남성에서는 9퍼센트 정도 위험도를 높인다라는 것입니다. 이 메타 분석에서는 첫번째 연구의 코호트 스터디와 같은 결과를 보여주었습니다. 남성에 대한 연구는 3편의 연구가 포함되었고 여성에 비해 적은 수(남성 75000명, 여성 195000명)의 연구 대상이 포함되었습니다. 그렇기 때문에 본 메타분석의 연구자들 또한 결론적으로 여성에서의 우유 섭취와 골반골절은 관련이 없고, 남성에서는 좀더 연구가 필요하다 라고 결론을 짓고 있습니다. 몇가지 근거들을 제시했지만 이러한 근거를 가지고 우유는 뼈에 아무런 도움도 되지 못한다 라고 결론내리고 대중에게 이야기 하는 것은 잘못된 것이라고 할 수 있겠습니다. 우유에 대해 최근 공부하면서 느낀것은 사람의 것이 아닌 송아지가 먹기 위해 만들어진 것을 수천년간 인간이 먹어온 것이 우유인데, 막연하게 좋을것이다 라고 생각하여왔던 이러한 우유에 대해 의구심을 가지고 시행된 최근의 여러 연구들은 확실한 근거를 가지고 있지 못하고 무조건 적으로 우유를 먹어서는 안된다 라고 이야기 하는것은 옳지 못하다 라는 것입니다. 물론 저지방유가 아닌 일반우유는 칼로리가 높기 때문에 비만의 위험이 있는것은 사실일 것입니다. 그렇기 때문에 하루 한컵의 우유를 마시는 것은 우유의 역습을 받지는 않을 것이다 라는 것이 제가 확실히 말할 수 있는 결론입니다. 이전 글간헐적 단식이 정말 효과가 있는 것일까?